Once again I stand sweating and fumbling in front of a Mexican pharmacy counter, having begun my day early knowing anything having to do with a healthcare system anywhere in the world is likely to take up the majority of your day. At least I have the good fortune of not to having to learn the ropes of Mexico in seeking out a medicine for a potentially fatal disease. Bullet-proof insomnia is my ticket on the train to tour the Mexican healthcare system. I don’t think insomnia has killed anyone yet. I’m sure the condition is inherited. I learned what a Miltown was from my mother before I learned how to ride a bike. One of the first stops was how to secure a sleep drug. The word for drugs is medicamentos in Spanish, not drogas, which means street drugs. You’ll want to learn that before you ask anyone for any drogas in Mexico. Ah, for the old days! When you could walk into any pharmacy in Tijuana or border town and buy practically anything without a prescription, stock up and mule it back over the border. My first quote for Valium, the stronger, addictive second choice, was easy to get with my American prescription. The price quoted was $39 U.S. (a fortune by Mexican standards for such a thing). After a few years in Mexico, you will learn that no matter what something costs, no matter how cheap it sounds by your inflated American standards, always get a second quote.I declined, walked up the street and bought the valium for $18 dollars at a different pharmacy as a backup in case I couldn’t find any Lunesta, a less addictive, less expensive choice. The next pharmacist insisted that Lunesta must not be made in Mexico ( I later found it is, but it's called Eszopiclone. ).To find a substitute meantbeing sent running up the street to a clinic, where for 500 pesos (a fortune by Mexican standards for such a thing) they would give me only single month’s supply of a substitute sleep aid. A one-month prescription would mean making a return visit every month and making the accompanying 500 pesos payment every time to renew the prescription (Where could they be picking up such racketeering habits - AMA conferences?). So, in conclusion it was much cheaper and less trouble to have the more dangerous drug, the Valium. Two days without sleep and matted hair gives you just enough crazy to scare attending medical personnel. “No saben ustedes? Primero, no causar daño!” (Haven’t you heard ”First do no harm!”) I yelled at them for not extending the prescription. Talking my case to my chief adviser and business associate, the Intrepid Elise, I learned that there was one of those little doctor’s offices right next to a gas station very near our house and also alongside a Farmacia Similares, pharmacies that sell generic drugs only. Within five minutes, a doctora made up like a Mexican movie starlet gave me a three month prescription for Xanax (Alprazolam). She charged me 100 pesos, about $5 dollars U.S (she charges the Mexican-Spanish-swinging Intrepid Elise 50 pesos). The pills cost $8 dollars a month. Satisfied that with prescriptions for three different sleep aids I would make it through the night, I went to Rico’s cafe next door, worked and swilled coffee. Such forays make still one more case on why Spanish (and Google) is essential in a country where people dislike saying either “no” or “I don’t know." A quick search in Spanish (“medicamentos para dormir”) would have disclosed that indeed, Lunesta (eszopicione) is a common sleep aid in Mexico. A good bit of the trouble I went to was due to this cultural aspect of trying to procure medicines in Mexico. You really can’t expect a pharmacy tech to try out all the vowels when hunting for your favorite drug. First do a Google search, in Spanish, and go armed with that. It's an easy mistake to mistake. My first month here I was convinced there were no gyms here because I was using English search terms in Google. For small daily needs (like sleep), those little doctor’s offices like the one I was directed to are all over Mexico’s towns and cities, tucked behind pharmacies and around hotels. The trick is to find the doctors in them who keep regular hours. Do not make these your primary doctor. For that you will want referrals from Mexican friends and fellow expats. Think of these small doctors offices as you would “docs-in-the-box” back home. Learn where the nearest one is before your next migraine, intestinal disturbance or sleepless night. Incidentally, the prospect of having to make monthly visits for a drug, and pay for each visit, makes a good case for obtaining your VISA Temporal as quickly as possible. With a VISA Temporal (the next level up from a Tourist Visa), you can begin the process of getting IMSS insurance, their government insurance. IMSS insurance would pay for something like a monthly visit if you were on a drug that required it, in addition to covering you in an emergency. IMSS insurance costs about $400 dollars a year. Once approved, theoretically, you could even come back to Mexico for services that it covers if you were looking at the alternative of paying out-of-pocket in the U.S. for routine exams. Monica Paxon has written an excellent general guide to the Mexican medical system, "The English Speaker's Guide to Medical Care in Mexico." Most recent: A two-country life requires a more than average amount of time at storage units. Closetbox is the storage service that this part-time expat had been waiting for! Next up: I see some amusing articles throwing the Peter Pan Syndrome around, accusing people who don't play by the rules as never growing up. Let's examine that. 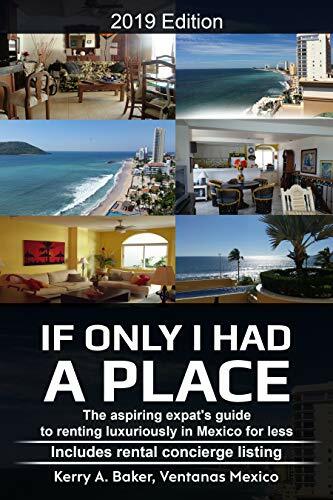 Kerry Baker is the author of "If Only I Had a Place" on renting luxuriously in Mexico as an aspiring expat and dhe "Interactive Guide to Learning Spanish Free On-line." As you learned from the story above, some Spanish makes a big difference. Get started today for a cheaper, safer, more interesting retirement in Mexico. 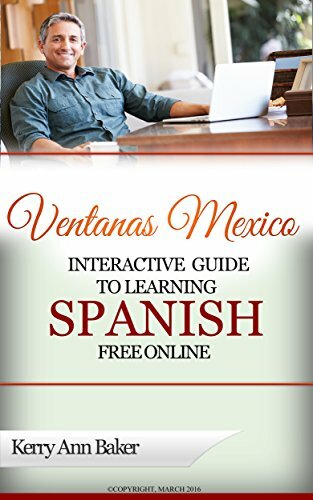 Use the Interactive Guide to create a unique lesson plan every day, or use the lessons provided in the book for every level. Study anywhere from your e-reader or laptop. I love my Acer Aspire! Slim, lightweight - It's been perfect for travel.